I've had a number of questions about my machine, the Designer Jade 35 from Husqvarna Viking, so I thought I'd write a post with my impressions and experience thus far. First up, let me say that I am a blogger for Husqvarna Viking which I how I came to be the proud owner of this machine. However, my opinions are honest. This isn't a sales pitch! Before owning the Designer Jade 35 (a sewing and embroidery machine) all of my sewing was done on a 1976 Bernina. When I was taking Textiles and Design in high school, we didn't use computerized machines. Either they weren't around (it was the late 80's/early 90's) or they would have been WAY too expensive to let a bunch of high school girls loose on! For example, the automatic thread cutter...is it really that hard to snip a thread? I'd never found it a chore previously! And the stop start button... again, I'd never found using the peddel controller an issue! Sure, these features are not necessities but after using them for the last 6 months (and I do use them, although at first I thought I wouldn't!) they are GREAT! Oh they make life easier and sewing just a little bit more pleasurable. I equate it to having a car with air conditioning; sure you can get places just as well in a car which doesn't have air conditioning but isn't it so much nicer to ride in air conditioned comfort (especially when stuck in Sydney's airport tunnel or M5 tunnel...or any tunnel really...)! - The fix stitch, with the press of a button (happens automatically when you start sewing, unless you've turned it off). You can achieve this on a manual machine with a reverse stitch but the fix stitch is just so much neater and easier! - I've already mentioned the thread cutter & stop/start button (rather than using the peddle controller). - The built in stitch advisory: you press the button for the type of fabric you have, including leather (!! ), and the type of stitch you want (seam, overcast, buttonhole etc) and the machine sets the perfect stitch. No more digging out the manual or just giving it a good guess! - Stretch stitch - this is not just a zig zag! It gives you a much better result when sewing knits. - Automatic buttonholes. I feel like I don't need to say anything more here...I mean, automatic buttonhole!!! With my mechanical machine my buttonholes were always slightly different sizes and I was never 100% happy with them (although, it was still better than stitching them by hand!). However, automatic buttonholes are a dream! The Designer Jade 35 sews them SO fast & they are perfect each and every time! - Moving needle position - you can move the needle incrementally to the left or right which makes a huge difference with zip insertion, top stitching, hemming etc. I just love it! - Adjustable speed. I'm a put my foot down and go kind of person and I love the speed of the Designer Jade 35, however sometimes you need to slow it down! I was recently making a bowl out of fabric scraps & couldn't understand why my thread kept breaking, however I discovered that when I slowed the speed of the machine the breakage stopped. I guess I was just sewing faster than the thread could handle! - Alerts: speaking of broken thread, the machine tells you if your thread breaks & stops sewing! I've been known to get to the end of the seam & discover that my thread broke somewhere at the beginning, now that doesn't happen! It also tells you if the machine needs to rest for a moment, which is great. - Machine embroidery: the Designer Jade 35 also does machine embroidery, which I absolutely LOVE. Hello monogrammed everything! I am not going to say too much about the embroidery here, as it will be an endless post, but it is SO easy to switch over to embroider. You just slide on the module, change your foot, needle & thread and you're away! Not only is embroidery on clothing really on trend right now, but it makes me feel like I'm designing my own fabric. I'm taking a piece of cloth and making it uniquely mine, not just by the garment I make but with the embroidery I choose. I love it! I could keep raving but don't want this to be an endlessly long post! I just wanted to highlight my observations and share what I love about this machine. If, like me, you are using an older machine and aren't sure if all the bells and whistles of a computerized machine are worth it, let me tell you they are! 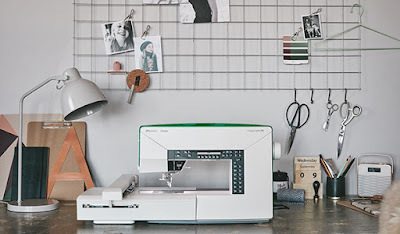 Sewing is even easier and more enjoyable with all the features I have available to me on the Designer Jade 35 (and I still haven't even tried them all!!). I hope this answers some of the questions I was asked on IG, if you have other questions please leave them in comments and I'll get back you to! I have acquired some optional extra feet for the Designer Jade 35 so will write a post shortly about those. Image from Husqvarna Viking...my sewing space isn't this cool!